For those of you who know me, The Edge of Never is my favourite book ever. Give me a book about roadtrips, finding yourself and finding love and I am so there, but the thing that I loved the most was that I related to Camryn, and when that happen to me, when I can see myself in a character, I am won over. So when I found out that J.A Redmerski was writing the sequel, I was pretty much ecstatic. Although the ending of TEON was pretty much perfect and it could have just been a standalone, I was happy to follow more of Andrew and Camryn’s story, and see how they were getting on in life. Those of us who have read TEON know what went down and how much we all sobbed and how our bins were filled with tissues, but we also know where it ends. The Edge of Always continues where The Edge of Never ends. Andrew and Camryn are head over heels for one another, they have shared and gone through a lot in the 5 months they have known and been together but you can see that they really are whole together – the missing piece to each others puzzles. Camryn and Andrew go through a heartbreak a few chapters in and you really feel for them. Camryn withdraws herself, tells herself and everyone else she is fine, for them to stop fussing, that she doesnt want to talk about the loss and you can see just how much she is hurting, yet she puts up a front. At 20, she has lost so many people in her life, she is scared Andrew is going to be another, so she withdraws so if it does happen, it be potentially not hurt as much…but of course, it will shatter her world and thats all she can think about now. Andrew is hurting too, but hes hurting for the loss and for Camryn. He loves her so much and its killing him that shes not opening up to him, so he is at a loss over what to do. He isnt the Andrew we know and love and that hurts to read too. He is pussyfooting around Camryn, but really, you can see why. He’s scared that she’s not herself and he wants to take the pain away, so he thinks of the one thing that they both experienced together….their road trip. Andrew, bless his little heart, spends a week planning out their roadtrip, hoping it will heal Camryns heart and heal her past. With the help of Natalie, despite not being her greatest fan, he learns things about Camryn’s past and he wants to help her through it. His love is stronger than ever, he wants to let her grief for everyone in her life whom she has lost one way or another and she is petrified that she is going to lose Andrew too. He wants to make her see that she will never lose him, ever. The roadtrip brings them together again, they visit old friends, old cities and discover new things too. We see the overpowering love the both of them have for each other – Andrew helps Camryn grieve, he gets her back to her old self, and really, the road is where they are meant to be. And it makes them realize that they can do anything and be anyone with each other, that they have their whole lives ahead of them and there is this whole world out there waiting to be discovered by them. We watch Andrew and Camryn grow up, we see them settle down, and seek happiness for what they have together. 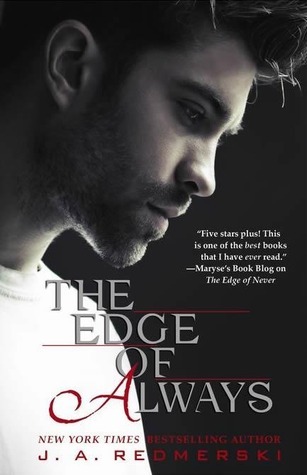 What started as a roadtrip, ends as one too, and although I liked this book, The Edge of Never and Camryn (and Andrew) will always hold a special place in my heart and I hope one day that I will be as brave as both of these. The perfect way to end the series. I loved seeing just how happy Cam and Andrew were.